I moved from Kannapolis, NC to Silver Spring, MD on June 29. I wanted to write a blog post before arriving in Silver Spring about how I expected my life to change as I went from being dependent on my parents’ car for nearly every trip to car free for every trip. Since I had to pack, keep up with emails and sleep at least a few hours per night, I ended up not having time to write this blog post. Now that I am in Silver Spring, I want to reflect on my experience so far with living car free. In order to check how I am handling living car free, I wanted to hear whether I would ever say, “where is my parents’ car when I needed it?” I haven’t said this once. Instead, I have asked, “why are people driving an automobile in a region that has good (could be improved in many ways) walking, biking and transit infrastructure?” When I asked this, I actually looked at my driver’s license and noticed it expires on September 19, 2016. This will occur after I have graduated from Portland State University and hopefully have started a full-time job. If I find a job in a location where I don’t need to drive an automobile, which I am determined to find, I am seriously considering not renewing my driver’s license. For the reasons I have discussed in previous posts and many more reasons that I haven’t written about yet, I would never have thought this in Kannapolis. However, since I have been involved with bike planning meetings in Kannapolis, I would like to say that Kannapolis recognizes that people are asking for healthy and liveable communities so it is working hard to make Kannapolis more bike friendly. I look forward to someday returning to Kannapolis and biking safely to do all my trips. I am confident this day will come before I die. Since the walking, biking and transit infrastructure is reasonable in the DC region, I have been walking, biking and riding transit for all my trips. This includes biking to work, walking to lunch, biking to the grocery store, biking and riding transit to downtown DC, moving from home to home by bike, and many other trips. While I can write an essay on my experience with each of these trips, I decided to focus this post on just a few aspects of my experience with biking over 50 miles in one day throughout the DC region. I included comparisons to the Charlotte region and the Netherlands. What better way to explore the DC region than by bicycle! 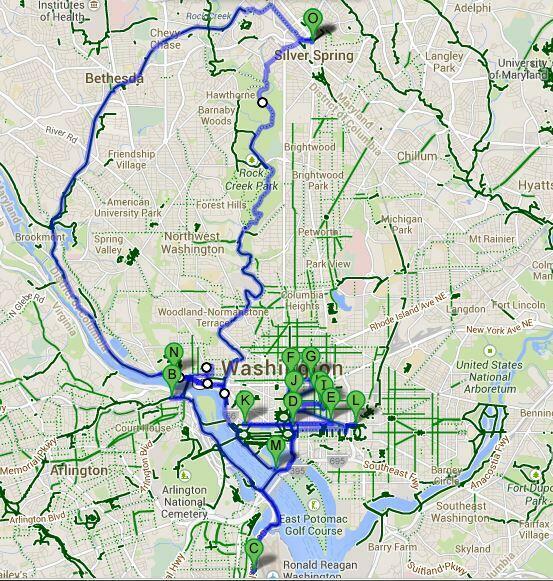 As the below map of my July 4 ride shows, I have biked over 50 miles throughout the DC region in a single day. I did another 50+ mile ride on July 20. Due to my cell phone dying both times, which I have been using for directions and counting mileage (both need constant use of GPS and 3G), I don’t have an exact number of miles. Having my cell phone die also brings up a very serious safety issue for me because I need a cell phone to call my cousin, who actually lives in DC, and police. I am currently looking at purchasing another battery and/or a bike computer so I can do everything I want to do and not risk my safety. Continuing with how I biked over 50 miles. The last time I biked over 50 miles in one day was when I was in the Netherlands during the summer of 2012. I have never biked over 50 miles in one day in the Charlotte region. While the bike infrastructure is slowly improving in the Charlotte region, which one can see with the Charlotte City Council’s vote to build the Cross-Charlotte Trail, not having biked at least 50 miles in one day in the Charlotte region informs me how terrible the bike infrastructure is in the Charlotte region. 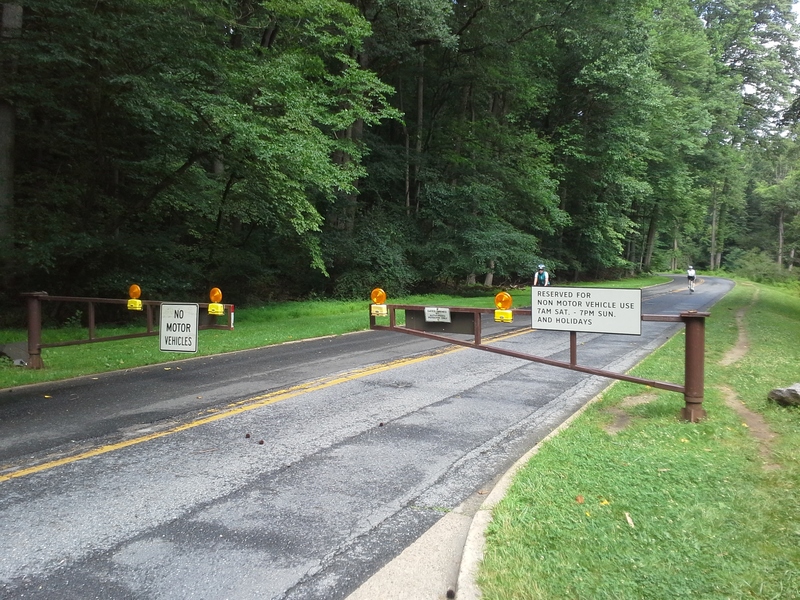 The main reasons I biked over 50 miles in the DC region was because the trail networks are well connected and last for miles and many roads like Beach Drive have slow-speed traffic and many cyclists to bike with. I start riding on these trails and roads and forget how long I have been riding. It makes it even easier to ride for miles when I ride alongside a stranger or two as we discuss our histories, why we love cycling, how we would improve cycling in the DC region, and above all motivate each other to keep going. I can’t wait to do this with my future classmates and coworkers as we ride thousands of miles together! I plan to bike over 50 miles every weekend I am in the DC region and continue biking over 50 miles per day as often as I can once I arrive in Portland. While the DC region has a great transit system, I find biking to be the best way to explore the DC region because I am not restricted to exploring where the transit system goes, it costs less to bike, biking is faster than walking, I enjoy getting lost in a neighborhood I have never been in before, I can stop where ever I want, I enjoy watching people as they move and interact, people on transit are usually glued to their cell phones or sleeping, and many other reasons. Since my parents, especially my mom, have been asking me what I am doing at my internship, I will provide a quick overview. Even though my title is Transportation Planning Intern at Toole Design Group, which I thought would have involved reading and writing transportation planning documents and less GIS analysis, all my work has been GIS analysis. In addition, the path to receiving my current internship was unlike any of my other internships and I have had several internships. Without writing another essay, I will just say that I applied for the internship in March after being recommended by a current employee in Toole Design Group’s Boston office for a full-time GIS Analyst position. I know the Boston employee from serving on the Association of Pedestrian and Bicycle Professionals (APBP)’s Young Professionals Committee. I ended up applying for both the GIS Analyst and Transportation Planning Intern positions. Continuing with what I am doing at my internship. After reading the internship responsibilities in March, I was informed what my internship responsibilities were going to be in June. Since I am currently working on a real project from the start of the project until I have to leave for Portland (short stop in Kannapolis), it was worth the wait to find out what my internship responsibilities were going to be. I have been using ArcGIS 10.2 and Google Earth so far to determine where 200 bike share stations should be located for Philadelphia’s bike share program, which will launch in 2015. I have been communicating with Toole Design Group staff in Portland, OR and Silver Spring, MD and City of Philadelphia staff. One of the things we communicated about was requesting data from the CyclePhilly App, which is shown below. I have never had an internship as fast-paced or involve as many people as this internship is. With the help of my supervisors, I have felt prepared for every challenge and am ready for what my next challenge brings! I want to write about many more aspects of my transition from car dependence to car free, but will save these aspects for future posts and in person discussions. Since I am interning full-time, taking time to eat so I can try to gain weight while biking, doing all the house chores (living alone at the moment), biking countless amount of miles per day, and trying to get enough sleep per night, I am not sure when my next post will be. I am writing new draft posts every day when I see, hear, touch, smell, and taste something I want to write about. I have so far written nearly 50 draft posts, which are ready to be fully written so definitely have plenty to photograph, research and write about. Yes, my next post should have less words and more photos.